Home » Blog » Does Your Pinterest Marketing Need a More Personal Touch? You’ve heard that Pinterest is a great place to attract customers, especially if your product or service is easy shown in images or short videos. So you set up a Pinterest account, started a few boards, and set aside a few minutes each day to like, pin, and repin content. But despite all that, something seemed to be missing. For a social media platform, shouldn’t Pinterest be more, well, social? Wouldn’t it be great to actually message your fans, instead of simply liking and repinning? You’re in luck. Pinterest introduced a new feature called Pinterest messaging in August 2014. This new feature gives you a new way to add a more personal touch to your Pinterest marketing by allowing you to send a message to individual fans, or even a small group! In other words, your Pinterest business account can now help you build real relationships with your Pinterest followers. These types of relationships build stronger bonds between you and your fans, and make them feel like they’re part of your business story. So let’s dive into Pinterest messages by looking at how and why you should use them, and who you should reach out to with your messages. Before we get into why Pinterest messaging is great for building relationships, you first need to understand how Pinterest messaging actually works. To help cut down on spam, Pinterest has made it so that you can only message other users on Pinterest when they are following one of your boards. This is actually a very positive “restriction” – it means that you can focus your messages on those who are already interested in your business! 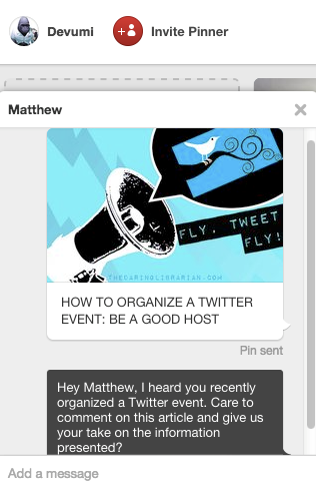 You can send two types of messages in Pinterest: individual messages, or group messages. Let’s take a quick look at how to use both of these options. Now type the name of the user you want to pin in the field. A pop down menu will appear with various similar users names. Select the right one from the search menu. You will see the person’s picture appear in the “To” column once you have selected them. Pinterest is image heavy, so don’t expect to see their name written out. Click “Next” and the window will pop down to the lower left corner. This is where it will stay the whole time you’re on Pinterest. 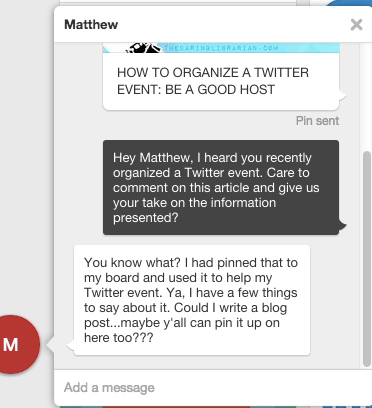 Messages sent on Pinterest can be text, and they can also have embedded pins. 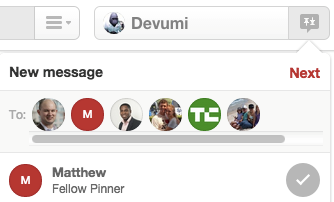 To embed a pin in a message, simply go to the board where it is located, drag it, and drop it into the message. Make sure you have the right one as it is sent automatically! This pin sharing feature in Pinterest messaging helps to really make your messages and pins a more intimate part of the discussion you’ll have. It also keeps that visual appeal of Pinterest high. While messaging people individually is fantastic, you may also want to message small groups of people. Pinterest allows you to message up to six people at once. This can come in handy when you find groups of people who all love what you do, and who are all interested in the same content. Do this by choosing six names when you click on “New Message” in the top right hand corner. Click “Next” and the box will pop down to the lower left hand corner, just like it does for individual messages. You can then send everyone the same pins and text. Now that I’ve covered how Pinterest message works, let’s talk about why you’d want to use this feature. As is the case on all social media channels, your primary goal with Pinterest is to add value to the conversations that are happening around your topic. Adding value puts your expertise in front of more people, who will then become interested in what you do and come back to your Pinterest board or website to learn more. When it comes to Pinterest messages, you will want to follow the same strategy. Make sure that your messages are being helpful and adding value. Sending a random video about a product that someone has shown no interest in is a TV marketing tactic. Online we call that spam. Instead, you’ll want to focus on your fans who have already shown interest in specific products, topics, or services. You might send them a personal message with a pin for your recent blog post, and a quick note about why they’ll find it helpful. You could also share other pins that would be of particular interest to them, or even ask them to comment on a pin or post that is especially relevant to them. 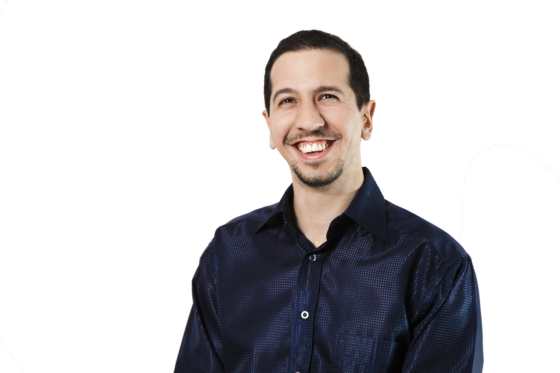 With all of that in mind, however, the ultimate goal here isn’t to be helpful: it’s to find more leads, and make more sales, for your business. Let’s look at a few ways you can use Pinterest messages to ultimately lead to more leads and more sales. Working with your most influential pinners forms the base of your Pinterest message marketing strategy. Your end sales goal is to expose your expertise to new audiences. The best people to help you accomplish this are your fans who already love what you do, and have a large following of their own! By asking them to repin your content and expose it to their audience, you’re putting your work in front of new audiences. Be sure that your content has a connection to your website or products. Rich Pins can be just the tool. Fresh content is a must on any social platform. When you work with creative pinners on content, you can build a sense of “ownership” among your fans, and give them a chance to be part of your business. When this collaboration centers around a new product, a sale, or a launch of a new online feature, it can create a lot of buzz and word of mouth excitement that will tie in with your end sales goals. Group messaging is a great tool when you have a big launch or other sales push. You’ll use the group messaging feature to reach out to your fans and let them know that something big is in the works. This can’t be a bland ‘10% off sale.’ This should be big holiday sales, a big launch for an online course or coaching opportunity, or business-wide discounts on all your products and services. If you’re going to talk to a whole bunch of users at once, it needs to be for a good reason and it needs to be relevant to each of them. Who Should You Message on Pinterest? So far, I’ve covered how to use the messaging feature, and why you should use it. Now, let’s talk about who you should be targeting in your Pinterest messages. The best place to start messaging is by figuring out who among your fans are the most active and influential. Take a look at your Pinterest dashboard to see which pins and boards are the most popular. From there, start recording the pinners who are the most active on your boards. These are your most active fans, and you can do even more to get them on your side once you start your Pinterest message marketing plan. Pinterest is an informal social media channel. You don’t have to give them the whole “Dear Mr. Matthew” spiel. A polite hello and cutting to the point will work – this isn’t LinkedIn! There’s also the fact that you know that this person is already interested in your business. They followed your board, so you ‘know each other’ already. Each influential pinner that you message is a little celebrity with an audience that you’re trying to get an endorsement from. Working with them on content, just like when Nike worked with Michael on the Air Jordan, further connects you with their expertise. The more their audience knows, likes, and trusts you, the more likely they are to also become your fans and clients. Little by little, you’re building all of these relationships into large followings of people who will be aware of your business and making purchases. Just sending out messages to your followers is nice, rather like sending a greeting card. But it doesn’t do much to really grow your Pinterest account. A tactic that has been used all over social media to get that growth is working together on content. So, you might send out a message inviting your fans to contribute ideas for a specific topic. For example, if you teach people how to build the perfect home office, you might ask your followers to post their pictures of their own home office set up. This can lead to fresh content, fresh ideas, and a whole new set of Pinterest followers. Pinterest doesn’t have the non-stop demand for new content the way that Twitter does, but people are less likely to come back to a board that never isn’t updated frequently. Know what they, and other Pinterest users, are interested in. It’s like having your focus group create your marketing for you. Will work hard to promote any of their content which you post to your board. It’s like having your focus group do your marketing for you. It’s worth nothing, however, that it can take some time to figure out what types of collaborations work best with your audience. Some of the messages you send won’t take off, and that’s ok. Every now and then you will hit on something truly remarkable, and all it will take is 5 minutes to send a message! The last piece of the Pinterest message marketing puzzle is what to actually say when you reach out to your fans. What you say will depend on whether you’re reaching out to your influential pinners one-on-one, or small groups of your fans in general. Now that you know who your most active and influential pinners are, it’s time to start reaching out to them! The type of topics that you’ll want to bring up with them will, of course, be about the things they have shown an interest in via pinning it to their boards. Remember that you’re looking to be helpful, which means both sharing your expertise, and giving them a chance to weigh in with theirs. You can also ask for their feedback about events in their own life. This can start a discussion, and maybe even generate some content, blog posts, or tweets about your brand. All it took was a couple of minutes to write the message, and this person and I struck up a connection around organizing a Twitter event. Individual messages are great when you want to make connections start a relationship. But you may find that you have several people with whom you’d like to share a particular message or piece of content. Say you have six people who all liked one particular pin. Now this pin that they all liked featured a nice pair of shoes that you make. When those shoes appear in a YouTube video as part of a magazine’s photo shoot, you can share that video to these fans. Include the pin they all liked, send a quick text message, then send the video. Sending the pin is a reminder of their interest so you don’t look like spam. And since they liked the shoes, they’ll probably love seeing them featured in a photo shoot! If you want to get really advanced with your group messing, you can include the magazine in question in the message. This way, you’re showing the magazine that you have an audience, and that you’d like to work with them on building connections together. Your group pin tactics should always include a large group of your fans who have shown an interest in the same content. Bringing in high profile Pinterest users can help spark discussions, and truly build in more brand loyalty. Ready to Start Messaging Your Fans? As with most social media strategies, there can be a lot of moving parts to using Pinterest messaging to market your product or service. My advice is to start small: identify a small group of influencer pinners that you’d like to build relationships with. Experiment with sending individual messages, group messages, and asking them to collaborate on new ideas. Over time, you’ll get more comfortable with what works for you, and you can expand your messaging to the rest of your fan base. Keep in mind that while your ultimate goal with Pinterest is to drive sales, your immediate goal is to be helpful and to build relationships with your fans. Where will you start with your Pinterest marketing messaging? Let me know in the comments below. And if you’re already using Pinterest’s messaging feature, let me know how it’s going. This is great information! I never thought about messaging an influencer through Pinterest – I always messaged them through their blog or Twitter. I wonder if influencers are receptive to being messaged on Pinterest? It sounds like a good experiment! I am not very impressed with the Pinterest message feature, but your article has given us ideas about how to use it strategically! Thanks for a new technique to reaching out to people you want to connect with. A variety of opportunities is needed today to stand out. Good morning, Matthew, did not know about this new messaging feature on Pinterest before this article. Thanks alot for showing us about the messaging feature. Really have to be more active on Pinterest as I am a lot more active on Twitter. Hope you have a great week. Thanks for the comments all! I’m glad to see that I’ve educated a few people on this newer feature, and that I’ve given you ideas moving forward. I personally feel that this is a great way to have more fun on Pinterest…and who doesn’t like fun?!? The worst case scenario is they don’t want to talk on Pinterest and you escalate to another form of communication. This is a good idea that hadn’t occurred to me, thanks for sharing. I hadn’t considered all the many ways to use the Pinterest messaging feature. You’ve given me great food for thought, and I can’t wait to actually try some of your suggestions. I love the collaborative idea for product launches, I think I’ll try that first! Hey Matthew, Super informative article! I will definitely be trying something of these Pinterest messaging tips. I love the idea of targeting influential pinners. Cheers! ‘how things went’ Welcome to the first thing I typed at 7am this morning….